The Ninth Kenting Tai Situpa, Pema Nyinje Wangpo was born in the wood-horse year in Yilung, near Dege in eastern Tibet. The Thirteenth Karmapa, Dundul Dorje, recognised Pema Nyinje as the reincarnation of the Eighth Situ Rinpoche, as did Pawo Tsuglag Gawa, who had received a vision from Padmasambhava, predicting Tai Situpa’s rebirth. At the age of eight, Pema Nyinje was enthroned with the Red Vajra Crown as the Ninth Tai Situpa. Pema Nyinje studied and practiced mainly under the guidance of his two principal Lamas, the Thirteenth Karmapa and the Tenth Shamarpa. He also studied with Dzingar Dorje Drakpa and many other accomplished masters. He became an erudite scholar, whose collected writings consisted of two hundred treatises filling three volumes. He was equally a very accomplished meditation master, with his Dharma activities flourishing throughout the lands. He recognised and became the root Lama of the Fourteenth Gyalwa Karmapa, Thegchok Dorje and fulfilled the same role for Jamgon Kongtrul Lodrö Thaye the Great. He also became one of the main Lamas of Dzongsar Khyentse Wangpo and the Great Tertön Chokgyur Lingpa. Tai Situpa gave these closest heart-sons the full Kamtsang lineage transmissions and instructions. Pema Nyinje Wangpo is often credited as having initiated what has become known as the Rimé tradition, which would become firmly established by his disciples. 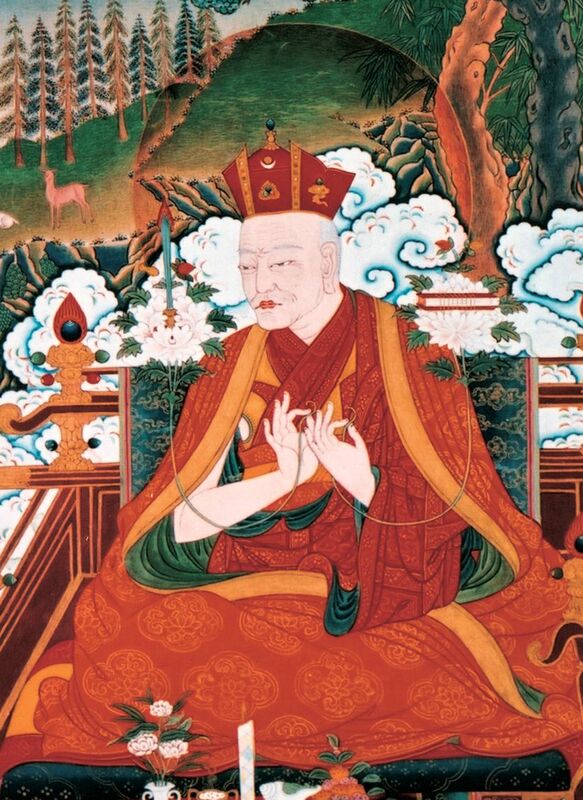 Tai Situpa also established many retreat centres, made innumerable offerings to monasteries of all traditions, and renovated the great monastery at Palpung, where he taught and inspired many devotees to practice diligently and to teach the meditation practices of the pure Kagyu lineage to others. At the age of sixty-one, Pema Nyinje Wangpo entered the retreat centre Drubgyu Samten Ling at Palpung Chökhor Ling Monastery and stayed in meditation until the end of his life. Many rainbows appeared in the sky and other auspicious signs manifested when, at the age of seventy-nine, he entered Parinirvana on the seventh of the fifth lunar month in the year 1853.